…so here’s a post about some birds at a spring. Okay, that’s a fairly weak way to start a post. I’m sorry. Second week in a new job and I come down with the flu. I really want to be in bed watching old episodes of Top Gear, but Corey will beat me if I miss any more posts, or at least make fun of how far I am behind everyone in the year list not a competition. And it really does feel like spring, finally. As I sat waiting for the bus home there was a wind, hardly a rarity here in New Zealand, but it was a warm wind, and that certainly is. It was… pleasant? Long may it last. The spring the birds I’ll show you today is far from the seat of New Zealand’s government where I now work. It’s actually found in a wadi in the United Arab Emirates, in the mountains between Dubai and the Gulf of Oman. I was in the country for a day two years ago, a layover between my last visit to the UK and coming back to New Zealand, and I had managed to arrange a mad-cap day of birding, a story for another day when I have more time and a less pressing need to watch immature car related television. 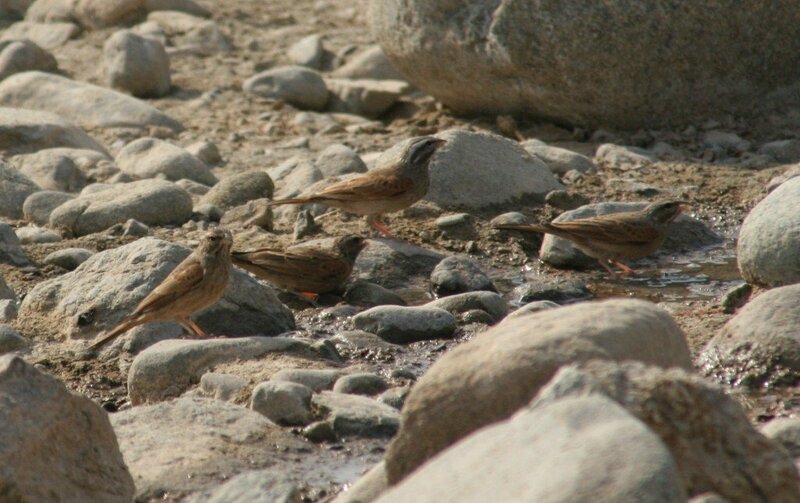 Anyway, this little tiny spring in the middle of a very dry desert attracted a whole swathe of interesting birds, one of which was a rather nice desert speciality, the Striolated Bunting. This member of the bunting family (that’s bunting, not sparrow. 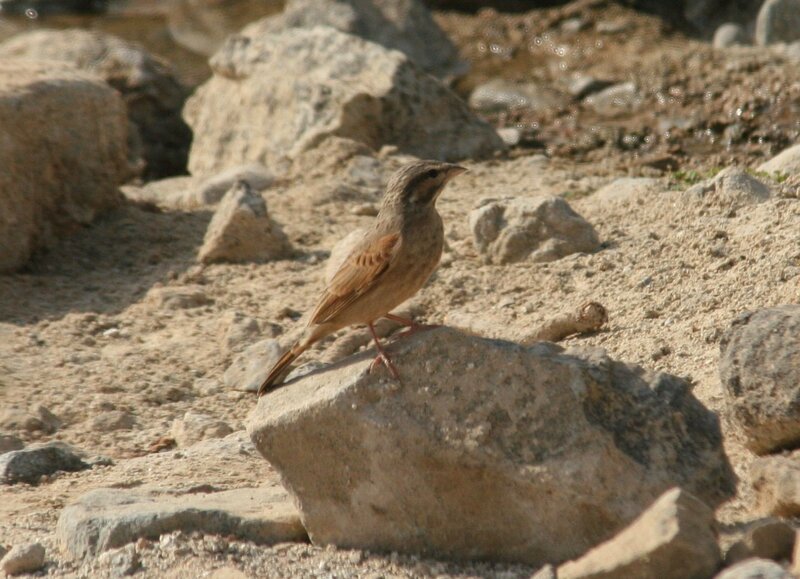 Sparrows are from the family Passeridae. Do try and get it right) is found from the Canary Islands to India; in the Middle East it is found in oases and dry barely vegetated wadis like the one I saw them in, in the drier areas of Syria, Saudi Arabia, Yemen, Oman, UAE and Iran. The species used to be lumped with the commensal House Bunting, but the two are now treated as separate species. 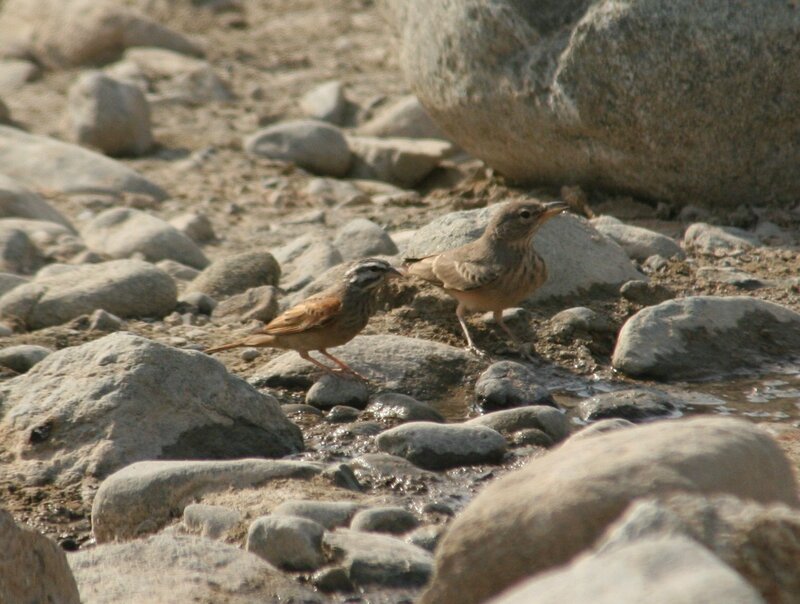 Striolated Bunting with a bonus Desert Lark (Ammomanes deserti)! I’m glad I didn’t have to fly to New Zealand and beat you. Wait, if I had I would see some great birds…maybe you could screw up just a little bit? Wind Turbines That Are Safe For Birds?